One thing that helped me in controlling the breakouts was applying almond oil by mixing it in with my cetaphil moisturizing cream. I was doing this daily and it did help in making my skin a lot better. But then it was unable to prevent new zits every day. So I thought of trying a new scrub or a masque. I had a 20% off birthday discount coupon from the body shop on anything that I choose to buy. 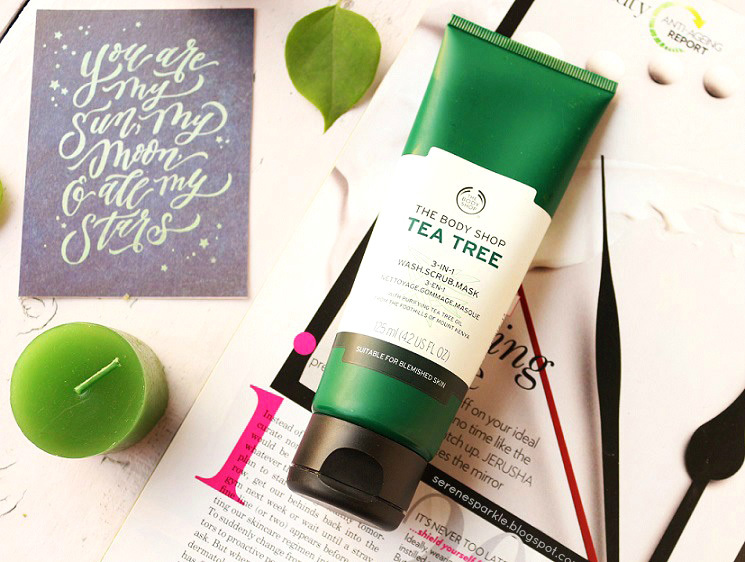 The tea tree range from the body shop has been raved by many but I've stayed away from tea tree products from any brand because I'm not too fond of tea tree scent. Still, I was like I wanna give tea tree range a try because I need to calm down my troubled skin. Among all the tea tree products in the body shop store, this 3-in-1 product caught my attention and finally I decided to get it. It's pale white in color with tiny green granules and has a creamy clay like consistency. As soon as it comes in contact with skin, it feels very cooling. And, for the first time I actually liked the subtle tea tree fragrance. It's quite calming to the senses. As a face wash it doesn't lather heavily but leaves skin feeling clean and fresh. It also takes away all the tiredness off the face. While scrubbing, the tiny particles exfoliate without being abrasive or harsh on skin. My face feels smooth and clean as it takes away all the dirt and impurities. Though, right now my skin is normal to dry but it didn't leave my skin feeling more parched. Also, it brightens the skin post scrubbing. I have used this mostly as a mask than a face wash and a scrub. I think it works best when used as a mask because just after two uses of this product as a mask, it cleared up my skin ! All the tiny bumps on my forehead and pimples on my skin are now gone completely. The blemishes left behind by those pimples have also faded away. I was surprised with the fact that it worked so quickly. It contains purifying tea tree oil from the foothills of mount Kenya ! Another star ingredient in it is the salicylic acid which is known to be the biggest battler of acne. It is often advised to people with oily acne prone skin to buy skincare products which have salicylic acid in them. It's very effective in case of milder acne and occasional breakout. It feels very soothing as a face mask, almost like a relaxing mini facial ! It smoothens and brightens skin. I wish I could keep this for longer time on my face but it dries up in 5 mins ! I don't use this as a face wash anymore because then I'm going to run out of it pretty quickly. If you are struggling with blemishes, acne scars and pimples, I'd highly suggest you to give this a try. Considering the fact that it's so effective and lives up to its claims fully, I think it's worth the price paid. The only downside is that it's not SLS free. This product came to my rescue and cleared up my skin ! I cannot recommend it enough. I think I will love it even more during summers and will definitely repurchase. Looks great product but it's pricy. Thanks for the review. 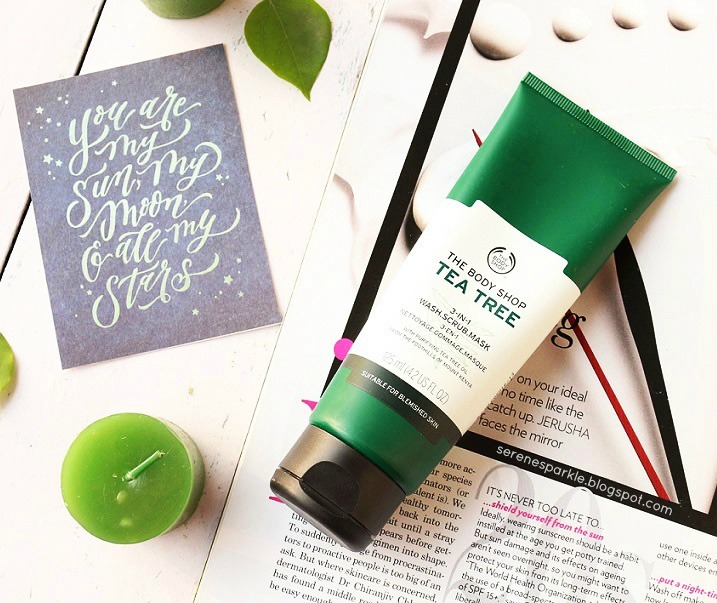 I have tried TBS tea tree creamy face wash and loved it. Will give this a try as I too have lot of zits and blemishes. Never liked the smell of this range, oops. Great review! Glad to know that it worked out for you, definitely I am going to give this one a try!